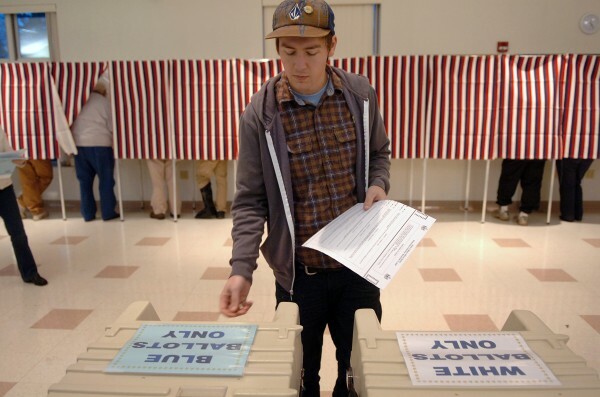 Jeremy Yehle casts his vote at the Hampden Municipal Building on Tuesday, Nov. 3, 2009. According to town clerk Denise Hodsdon, by about 4:30 p.m., more than 2,500 of Hampden's 5,800 registered voters had cast their votes, either in person or by absentee ballot. A proposal to use runoff voting in Maine faces a steep climb in the Legislature — it would need support from two-thirds of lawmakers to be enacted. The bill shouldn’t be dismissed out of hand, however. Instead, lawmakers should set up a study committee to take a closer look at the issue, which deserves further consideration. No Maine governor in the last half century has been elected with a majority of votes. This raises the question of whether a runoff election would better reflect who voters really want to run the state. If a governor gets more than 50 percent of the vote does the public more readily accept his policies? In 1974, Independent James Longley was elected with 39.7 percent of the vote; in 1978, Democrat Joseph Brennan was elected with 47.8 percent; in 1986, Republican John McKernan was elected with 39.9 percent; in 1990, Gov. McKernan was re-elected with 46.7 percent; in 1994, Independent Angus King was elected with 35.4 percent; in 2002, Democrat John Baldacci was elected with 47 percent; and in 2006, Gov. Baldacci was re-elected with 38 percent. Last year, Gov. Paul LePage was elected with 38.3 percent of the vote. In the other years, the candidates won by more than 50 percent. Based on this history, Sen. Tom Saviello, R-Wilton, has proposed that a runoff election be held if a candidate for governor doesn’t receive more than 50 percent of the vote in the initial election. LD 607 was heard by the State and Local Government Committee last week, where it got a cool reception. Legislators have considered runoff voting before. In 2005, the Legislature established a commission to study alternative voting along with other election issues. In its 2006 report, the group said instant runoff voting was too complicated for its review. With instant runoff voting, voters rank candidates rather than choosing just one. In each round, the candidate with the fewest first-choice votes is eliminated until there is a candidate with more than 50 percent of the vote. In 2007, lawmakers considered a bill to begin using instant runoff voting in 2014 for the governor’s race. It was rejected. Runoff or instant runoff voting could build confidence in the election process, force candidates to run more positive campaigns and give people more reason to vote. Or it could just cause a lot of confusion and be a big waste of money. Lawmakers should want to find out which is more likely.